﻿ Report from Dewayne and Rita Shappley. April, 2014. 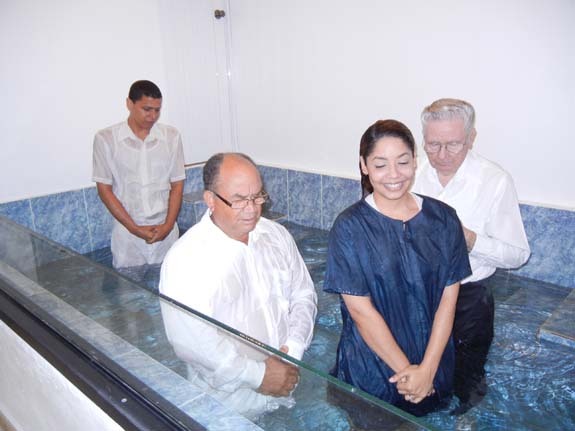 Juan Carlos Jiménez and Christie Báez baptized in Bayamón, Puerto Rico, April 13, 2014. 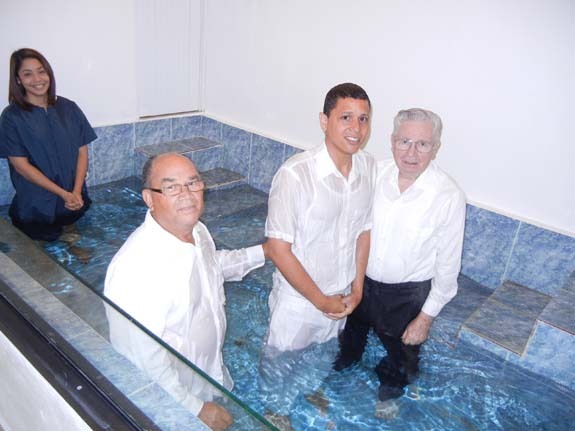 Alfonso Estrella and Dewayne Shappley baptize Juan Carlos Jiménez. Christie Báez is waiting her turn. Christie expresses her joy of salvation as Alfonso Estrella, on the left, leads us in prayer after her baptism and that of Juan Carlos. Juan Carlos and Christie are married April 27, 2014 in the Bayamón church of Christ meeting place, two weeks after obeying the gospel. Dewayne performed the marriage ceremony. This is truly and inspiring story, especially to those of us who have known Christie since she was born to Francisco and Jeannette Báez twenty-three years ago. Her parents divorced when she was in her teens, and Christie walked on the somewhat wild side as she grew older, but her father never stopped attending services nor asking the church to pray for her, as well as for his son Brian, who is now sixteen. 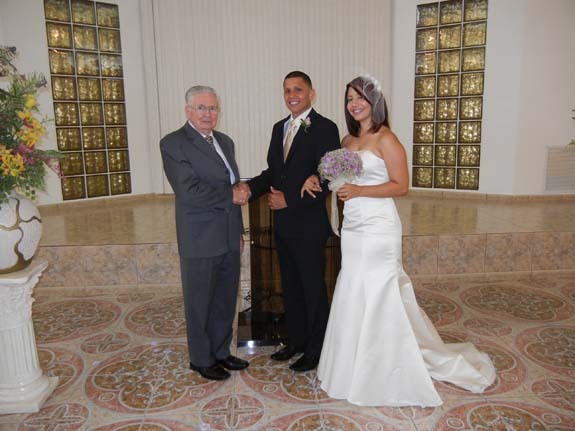 Juan Carlos and Christie met when both worked in Macy’s, in the Las Americas Shopping Center, in San Juan. As time went by, they started living together without marrying. Then, one Wednesday night in early April, both came for the devotional and a PowerPoint illustrated class I have been teaching since January on “Events of the Past and Future that Motivate Me to Walk a Straight Line in the Present.” After the service, we talked for a short time, both indicating they were thinking about baptism and having a right relationship. Of course, I offered to be of any assistance I could. They returned the next Wednesday, and the following Sunday both attended. Christie came forward at the end of the invitation song, with tears of repentance, and while we were speaking briefly, Juan Carlos also came forward, not holding back his own tears. Asking Alfonso Estrella and José Álamo, two other leaders of the congregation to join us, we went to a room where we could talk privately. Two options were open to Juan Carlos and Christie: They could separate and be baptized that very Sunday of April 13, or they could get married and then be baptized. We left them alone to make their decision, and within a few minutes both agreed they would separate so that they could be baptized without delay, for, as they said, they wanted to put God first in their lives. With great rejoicing, we proceeded to baptize them. Two weeks later, they were married in the Bayamón church building, and have continued to attend faithfully. Christie now works for a buffet of lawyers and Juan Carlos, 31 years old, has temporary work with the Department of Justice. E-mails and Notes reveal much about the material on our sites and positive reactions to it. E-mails are in order of date. -Lima, Perú. April 08, 2014. “Esteemed servant of God, thanks for the great help you provide me, putting at our disposal these materials of great importance at the present time. I expect to make them known, and know more about you. Thanks and God bless you.” Alejandro Roque Beterma. Referer: "http://www.editoriallapaz.org/transparencias.htm. -The Referer indicates Alejandro sent this e-mail from a Page listing hundreds of graphics for transparences we have prepared over the years. These may also now be copied directly from the Internet and pasted in PowerPoint slides. I have already done this with many, making them available as PowerPoint presentations. -The tract mentioned is the most effective one we have prepared, printing millions of copies and registering literally thousands of conversions attributed to it. Together with some of the other tracts produced during our time here, it is on the Internet, and available also in PDF format. -Place not identified. April 10, 2014. Brailam Estepan has asked me a dozen questions on difficult subjects. She says some on Deity and angels are the last ones, adding: “Before anything, allow me to say I admire you a lot.” I take such statements with a grain of salt, rather giving honor to God, and discreetly urging that we concentrate more on what is easy to understand, striving to obey it in our daily lives. On April 27, we received the following e-mail from Brailam. -I recommended she go to the directory on editoriallpaz of congregations for the county where she lives and make contact with the church by that means, or tell us where she lives so that we might help her directly. She replied as follows. I sent her data we have on Spanish-speaking congregations in New Jersey, and also put her in contact with Esteban and Tiny de Jesús, in New York City, a couple I know personally. -Bogotá, Colombia. April 18, 2014. “In the year 2009, approximately, a person living on Arcadio Street gave me a tract (a laminated, legal size sheet), the title of which is ‘Were Tithes Abolished?’ Of course, it stirred up my curiosity, for since I was 14 years old I had been instructed in the evangelical world on the importance of the tithe. So it was that I took it to my house, washed it, because it was pretty dirty, and set myself to read it, hold onto it and, as might be expected, investigate its origins. This document provides answers to 41 questions, and has the following at the end: Written by D. Shappley de Álamo. Then come the words ‘Presented by:’, a blank space, and then farther down: For a complete list of books, booklets and tracts, write to Jaime Restrepo M., Apartado Aéreo 1254, Manizales (Caldas), Colombia, S.A. The truth is I tried to find both parties, but, strangely, was unable to contact either of the two people. I also looked on the Internet, but did not locate them. I retain this document to the present time, and given that lately I have had the desire to study the Sacred Scriptures, and that actually I am studying theology in the Baptist University of Cali, again I have felt the concern of finding a Christian congregation that holds tithes to have been abolished. … I give up on my search for the true church of Christ in this time, having considered it lost in time. I have searched for the primitive church established by the apostles, and have not been able to identify it in the midst of so many apostate churches in Bogotá. I call them the Business of Faith. -I replied and forwarded the e-mail by Juan Pablo to Johnny Montaño, in Bogotá. -Observations and follow-up. Considering the title and format, the tract referred to by Juan Pablo was probably printed by us in the 1980’s and sent to Colombia. If I remember correctly, we did actually laminate a quantity of them ourselves before shipping them to different places. Later we changed the title from a question to an affirmation, improved the text and printed the material in a different format. It was, in its printed form, and continues to be on the Internet, one of the most effective studies we have produced. -Place not identified. April 22, 2014. “Hello. I am a Catholic, and by chance found your Web Page. In truth, all I have read to the present appears to me to be certain, and, above all, according to the Scriptures. In my zeal to know whether or not the Lord wants me to continue in my religion I have read several sections. With respect to the Roman Catholic Church, mention is made that Pope Francis claims supremacy. Could you tell me where I might be able to confirm that, since I have not been able to find information on the Internet. Many thanks in advance. God bless you.” Laura Cecilia de la Torre Ramírez. Referer: "http://www.editoriallapaz.org/salon_iglesia_catolica.html"
-Laura sent this e-mail from the Page which contains a list of material on Catholicism. I referred her to “The Great Whore… Reigns over the Kings of the Earth.” This study, available at www.editoriallapaz.org/apocalipsis_8_Acto3_reinasobrereyes.htm., is Act 3, of Chapter Eight, of the commentary on Revelation. “Scandalous, Convulsed Drama of a Powerful, Immoral Woman, Avaricious, Persecuting, Incredibly Cruel and Even Bloody” is the sub title of Chapter Eight. Indeed, she has pretended, and to this day pretends, to govern the whole world and be worshiped by all human beings. “Act 3”contains data and pictures of the triple crown used by the popes up to most recent times, as well as documents showing they claim universal authority over both political and spiritual realms. -Santiago, Veraguas, Panamá. April 24, 2014. “My esteemed one, this material was very edifying. Thanks.” Rosario Díaz. Referer: "http://www.editoriallapaz.org/mujeres_agrupaciones_clases.htm"
-Reference is to a study on “Activities of Christian Women in the church of Christ,” for example, teaching a group of young people in a class setting. It is based on a series of questions and examples received in an e-mail. One sister called another “sectarian” because she taught such a class.